On Saturday afternoon, one difference between the Orchestre Révolutionnaire et Romantique and the modern-instrument orchestras that typically set up in the Kennedy Center’s Concert Hall was clear even before the opening smack-in-the-face chords of Ludwig van Beethoven’s “Egmont” overture — the orchestra occupied maybe half of the chairs that, say, the National Symphony would have. The ORR, as conceived by its founder, conductor, and artistic director John Eliot Gardiner, tries to make music in the manner and spirit of the time the music was composed, which here meant that reduced forces had to try to fill with sound a much larger hall than those in which this all-Ludwig program would have first been heard. Still, those chords did indeed deliver a proper smack, which speaks to the ORR’s virtues. First, where a modern orchestra sounds plush and rounded, the ORR sounds leaner and sometimes rougher. Even when played with exceptional skill, their instruments often have a bit of a rasp or a tang to them, and they’re never as loud. The period horn, a fiendishly difficult instrument to play, tends to wobble a bit or even crack (though I only heard one crack on Saturday in two solid hours of concert). The kettledrums actually do make a more smack-like sound than modern timpani. The flute sounds tentative, almost brave for standing up among the others and making itself heard, but also seduces with overtones. Another factor in smack-delivery: Under Gardiner, these ladies and gentlemen sounded as tight as the 70s incarnation of James Brown’s band, even while untangling counterpoint more complex than anything Brown threw at Maceo Parker. (I am not saying Maceo couldn’t have done it.) Rhythms stayed super-sharp even when shifting or not as prominent; melodies sang out in unison. With that unanimity and the intensity of effort at getting these instruments to make properly orchestral sounds, everything felt alive, bristling with potential. And so it was that we began “Egmont.” Consistent with period-performance practice, Gardiner pressed forward with his tempos here and throughout the concert, but he didn’t let those tempos straitjacket him — when he took his pauses in “Egmont,” he drew them out and made them count, leaving me a little breathless on one occasion. It helped that the ORR can actually play at said fleet tempos without sounding hurried. This proved especially useful in the first movement of LvB’s third symphony, the “Eroica,” which acquired a heroic sweep from the contour of its melodies and Beethoven’s relentless development of them rather than a pace slowed by a desire for stateliness. Their “Eroica” also showed how dense with invention this symphony is: Details and countermelodies that often get drowned out in modern-instrument performances by whatever section is playing loudest at the time here emerged in natural proportion and counter-proportion. The development teemed with activity; at times, each section seemed to be separately trying to work out the problems of a knotty dissonance or a sudden change of key, which sharpened the surprise when Beethoven pulled a solution out of thin air. The rest of “Eroica” was a revelation as well: the perfectly pointed fugato development of the second movement’s funeral march theme, the ridiculously talented horn players (Anneke Scott, Joe Walters, Jorge Renteria Campos, and Chris Larkin) romping through their ridiculously hard trio from the Scherzo, the finale ablaze with color and drama. Never have I felt as satisfied to hear the “Prometheus” theme emerge after Beethoven spends so long teasing us with its harmonic underpinnings; never have the subsequent variations seemed so much like a novel in music, with the theme’s transformations composing the narrative. I tend to avoid concerts featuring Beethoven’s Fifth because overfamiliarity has dimmed its charms for me. In the iconic first movement, Gardiner and the ORR played splendidly; having been extremely spoiled by this point in the concert, I was disappointed not to feel the excitement of hearing something new. The second movement, though, normally sounds to me like a swamp of brass taking a curious melodic idea and making it sound awkwardly grandiose; with the less opulent, more transparent sounds of the ORR (and Gardiner’s careful management thereof), you could actually hear all the parts that Beethoven had written, and suddenly the movement made sense. Gardiner has a sure sense for shaping a melody, obviously, but even by Saturday’s standards the third movement of the Fifth excelled; the pizzicato tiptoe up to the bridge to the finale, in particular, flowed along deliciously. The finale, also a brass swamp in many conventional performances, here sounded as good as I’ve ever heard it. This review is at an exhaustive length now, but I could go on enumerating virtues for paragraphs and paragraphs. Let’s just end with my sincere thanks to the Washington Performing Arts Society for bringing Gardiner and the ORR to the DMV. This will likely end up being the best concert I see this year. Other People’s Perspectives: Charles T. Downey, Joe Banno. Also, you can hear their concert three days earlier at Carnegie Hall (substituting the Seventh for the Third) here. And here’s a fascinating blog from the ORR’s Beethoven tour. I don’t normally cover out-of-town ensembles on DMV Classical, because that’s not really the point of the blog. But I had to go see these dudes because I was a big fan in high school, and you know how much you love things that you loved in high school. In fact, when I had just gotten my driver’s license, the first order of business was to make cassette tapes of all my favorite music so I could cruise around in my parents’ Ford Taurus station wagon bopping to said tunes. (Someday, young people, your methods of music intake will seem just as antiquated.) Gardiner’s set of the Beethoven symphonies with the ORR had just come out, and I was bowled over by the unstoppable dance energy of his rendition of the Seventh’s outer movements, so it was a natural for taping. Do I blame this accident on the JEG/ORR performance of the Seventh? No, obviously. Was it a contributing factor in my incompetent operation of a motor vehicle? Yes, definitely. And while I love many different recordings, I have only ever loved one enough to operate a motor vehicle unsafely because of it. Plus, the accident happened on Veirs Mill Road in that netherland between Wheaton and Rockville, so covering this concert is totally within the scope of DMV Classical, right? 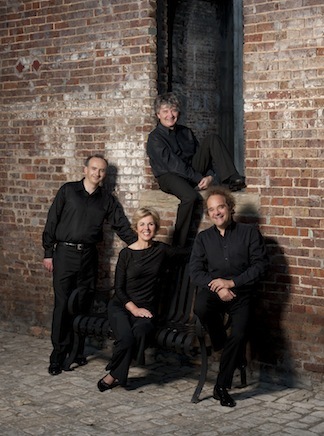 The Takács Quartet returned to the University of Maryland Saturday night! That warranted an exclamation point because the Takács played for Terp Nation many times at the Inn and Conference Center and in the old halls in Tawes, but they had not previously set foot in the Clarice Smith Performing Arts Center, which opened in 2001. I began going to classical concerts with my parents at the University of Maryland when the Takács were coming twice a year, and I’m guessing many of those present Saturday night remembered those concerts too. The personnel of the quartet have changed. Early concerts brought the first, all-Hungarian lineup to UMCP, but now the only original members are second violinist Károly Schranz and cellist András Fejér; Edward Dusinberre, who joined in 1993, mans the first violin spot, while Geraldine Walther, a 2005 addition, womans the viola position. Yet the Takács approach has remained consistent: They’re four musicians having a dialogue and exploring a work, rather than a monolithic organ of unified super-precision sound. Sometimes on Saturday their tones aren’t perfectly matched, and there were a few slipups of ensemble, sloppy phrase endings, and the like. But the musical conversation led to some penetrating readings that reaffirmed the Takács’ status as one of the most interesting quartets of our time. TQ, chillin. Photo copyright Ellen Appel. Some quartets that play Leoš Janáček’s Quartet no. 1, the “Kreutzer Sonata,” focus on creating a cinematic, sweeping feel to the proceedings, which depict a wife’s seduction and her husband’s vengeful murder; that strategy sometimes lends a glossy quality to a raw work. In the Takács’ hands, the drama felt uncomfortably intimate, with Janáček’s contrasting gestures in the first movement seeming to undercut each other and create additional unease. The seduction theme of the second movement strutted awkwardly, like the hiccup of a blustery drunk, yet its forward progress felt inexorable as well, making this a bluntly effective suitor. Dusinberre gave a quick talk before the Janáček, with musical examples and funny jokes, in which he explained why the Takács have decided that the murder is actually depicted in the third movement, rather than the fourth as our program notes had it. They played it with conviction, making it vivid and violent but also teasing out the uncertainty and remorse, then provided further perspective on the goings-on in the finale. Throughout, the music felt slippery and surprising, but also devastatingly powerful. Benjamin Britten’s first quartet, which followed the Janáček, was the least musically interesting of the three quartets on the program and got the weakest performance. Britten’s first and second movements don’t have much to engage the ear other than rough shifts in texture, and the supposed-to-be-ethereal high harmonics of the first movement, underpinned by plucks of the cello, go on for too long and were rendered somewhat unevenly by the Takács. The third movement, though, carved out an affecting lyrical path from stony monoliths of sound, the Takács showing they can make a big unison noise when desired, and the finale threw off the seriousness of the preceding movement and scampered around cheerfully. After intermission, the Takács began Maurice Ravel’s string quartet at a little quicker tempo than normal, eschewing French langour for a gentle flow forward; their playing seemed to smile gently and affectionately at the wit of Ravel’s writing, which has rarely seemed so tangible to me in this quartet. They emphasized the tempo shifts in the second movement, teasing out a sense of play here as well. The third movement had a classical poise, flickering between light and shadow without being dominated by either, and the Takács had plenty of well-mannered fun in the finale, yet remained poised and coolly commanding. Though the Takács have visited other venues in the DMV in the interim, Saturday’s concert felt like a homecoming, at least to me. Let’s hope they return soon. In Janáček’s quartet, the first movement may be interpreted as an introduction to the unhappy woman, while the second movement can be seen as a description of the seduction of her by the violinist. A brief quotation from Beethoven’s “Kreutzer” Sonata in the third movement points to the performance of the work in Tolstoy’s story, and the torture and murder of the woman may be found in the agitated passages of the fourth movement. Mrs. Coolidge came over to see us in the afternoon—and has definitely commissioned me to do a quartet for her—to be played next September over here! Short notice and a bit of a sweat to do it so quickly, but I’ll do it as the cash will be useful! Exclamation points warranted indeed! Get that money, B-Squared. The macro reason I enjoy classical music is because my parents do – for a while, I didn’t realize that not every family had a policy regarding whether Bruckner will ever be played in the house (answer: no). But the micro reason is two concerts by the Takács Quartet that I heard when I was about 12. Back in that day, student tickets to concerts at UMCP were $3, meaning my parents were happy to bring me along when they had a subscription concert, and the Takács were coming to campus twice a year for some reason unknown to me. I would sit in my random seat in the back of the auditorium before intermission, then move up to sit with one of my parents for the finale. They had been subscribing for a while and were thus in the third row, so if a good performance was occurring, I was right there hearing it. One concert featured Haydn’s Rider quartet, a Bartok opus lost to the recesses of my mind, and Brahms’ first piano quartet. The whole concert was pretty amazing, but I remember specifically feeling like the “Hungarian” finale of the Brahms had the energy of a freight train and was coming straight for me. The rondo episodes felt like oases in which I could relax before the storm started again. It was an intensity I had not heard in music up to that point, and I wanted to feel more of it. The concert that made me want to understand music more, though, came later. The program-closer this time was Beethoven’s Op. 59, no. 2, whose finale famously begins in the “wrong” key of C major before modulating with a cruel inexorability into E minor. When the quartet began blasting away at Beethoven’s choppy finale-opening theme in C, I felt deep in the pit of my stomach that something was wrong – it was a physical feeling, not an intellectual one – and when the movement closed with its emphatic E minor it was a surprise I could nevertheless hear coming. Figuring out why that happened was my first step on the road to classical music, and I’ll always be thankful to Schranz, Fejer, and the other two original members of the Takács (Gabor Takács-Nagy and Gabor Ormai) for giving me the emotional jolt necessary to stimulate that intellectual investigation. Marin Alsop loves Aaron Copland’s music, and on Friday, the audience at the Music Center at Strathmore could tell just how much. She called him “the quintessential voice of American orchestral music” at the Baltimore Symphony Orchestra’s latest “Off the Cuff” concert, before they played Copland’s most famous work, the orchestral suite from his ballet “Appalachian Spring.” Alsop followed her usual “Off the Cuff” model for pre-performance talks: an introductory bio of the composer, sprinkled with telling anecdotes and effective jokes, then a discussion of musical landmarks in the work at hand. She had the orchestra illustrate the open, limitless effect the so-called perfect intervals can have by playing the first few notes of Copland’s “Fanfare for the Common Man,” and she brought out baritone William Sharp to sing “Simple Gifts,” in Copland’s arrangement, just so the tune would be in our heads for the finale. Though Alsop’s presentation always held my interest, at times I wondered whether it might be overkill for “Appalachian Spring,” which holds its place in popular esteem (and the Music Center was packed to the gills for this one) by being so immediately approachable. There’s certainly value in understanding it a bit more, as with the intervallic discussion, but I think anyone could pick out when (for example) Copland introduces a fiddlin’ tune. I could be wrong. The performance itself had a common weakness of Alsop-led readings — a sometimes indistinct rhythmic pulse. Copland wants these rhythms to snap and crackle; sometimes the BSO wouldn’t quite hit a beat all at once, or hit a beat as sharply as they should’ve. But Alsop’s strengths also came through. When playing the hushed, almost devotional music that begins and ends the suite, the BSO managed to play as if whispering, with the clarinet at the beginning sounding like daybreak. In louder, faster moments, the BSO sounded bright and piquant, and one could feel the enthusiasm from conductor and orchestra that ultimately carried this performance along. It would have been hard to resist, and no one in the hall on Friday appeared inclined to try. 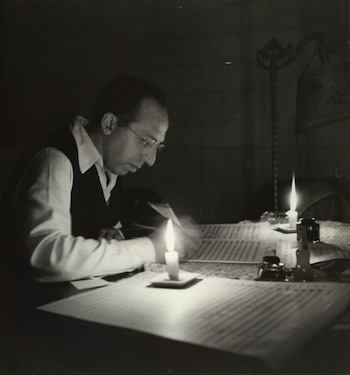 “Appalachian Spring” is not quite long enough to fill even a short program like this one, so Sharp provided bonus content: six more of the “Old American Songs” that Copland arranged for voice and orchestra. Yes, there was a singalong, in which the audience got to make all the barnyard-animal noises of “I Bought Me a Cat,” and yes, I thought it was the highlight of this portion of the concert, mainly because I got to make a horrible honk of a goose noise many, many times in the context of a supposedly respectable orchestral concert. Sharp seemed to enjoy making such noises even more than I do, and that zest showed up in the rest of these songs as well. Obviously, he can make a beautiful noise, as songs like “At the River” showed, but it’s even more impressive to hear a voice stay beautiful when packing lots of words into lines and inflecting them in a natural manner, as in “The Dodger,” where he explained with jaunty glee how we are all corrupt liars. Sharp made a giant lyrical flub in “Ching-a-Ring Chaw” that necessitated a restart, but the good humor of the evening had been established so thoroughly that it would have seemed churlish not to forgive him immediately. Plus, how can you be mad at this guy? From Sharp's management's website. Sharp, of course, was at Strathmore last week for these Post-Classical Ensemble concerts, singing songs of Charles Ives. Since Sharp teaches at Peabody, it was probably a matter of commuting rather than staying in MoCo for a week, but the connection between last week and this week nevertheless invites one to contrast — the small tweaks in Copland’s songs communicating his essential affection for his source material, Ives not loving his sources any less but feeling freer to distort or transform them. As Alsop noted in her intro, Copland’s America was “the America of his imagination and his dreams,” as he never strayed much from his native Brooklyn except to hit France to learn how to compose. Ives trod his New England path doggedly, finding endless variations and surprises in what was familiar to him. Copland, a socialist, wanted to compose for the masses; Ives, a real-life insurance exec, had the means and inclination to compose for himself. Copland recognized Ives’ genius and advocated for his work, and it’s not like we have to determine which one is more quintissentially American than the other, but they certainly show two different paths to American greatness. Kudos to the P-CE, the BSO, and Strathmore for making the juxtaposition possible — always a nice way to leave a concert, with one’s mind full of unresolved, excited thoughts. Besides being very large, Friday’s audience was also very old, more than normal even for symphony orchestra concerts. (Indicating that some stereotypes are true, the garage at Strathmore was nearly unnavigable before and after the concert due to tentative driving of large cars.) In the post-concert Q&A, for which Sharp joined Alsop, one person actually asked, “We’re, some of us, getting older…Is this a concern to you?” Alsop speculated that people tend to come to classical music later in life, at least if they’ve had childhood exposure to the stuff. Coming from a family that went to classical concerts pretty much from when my sister and I were old enough to be babysat, I have no idea whether that’s true. Tickets are expensive. If I wasn’t getting press tix, I would probably go to the symphony two or three times a year, for specific programs or performers. I’d concentrate my concertgoing at venues with free or cheap tickets (Library of Congress, Freer/Sackler Galleries, etc.) and at chamber music in general, where tix tend to be cheaper. For someone with a casual interest in classical music, $65 for a non-nosebleed seat is a steep hill to climb. Sometimes, what is happening is kind of boring. This is true at any type of event, of course, but at classical concerts such a reaction is looked upon as reflecting a lack of education rather than a justifiable judgment. Other people’s post-concert questions. One person asked “whether there are American musicians today reaching down to indigenous music from the classical sphere.” Note the telling preposition! Another guy asked whether Alsop and Sharp had heard the new Tony Bennett album, and what they thought of it. Fortunately, Sharp had an actual opinion on this, so the questioner was not left hanging, but it could have been quite awkward in addition to being kind of a bizarre choice of question. Charles Ives cheerfully ignored boundaries and received wisdom, writing music primarily to satisfy his own enthusiasms, and still pushed music forward in the process. It takes a group like the Post-Classical Ensemble, equally committed to ignoring boundaries and received wisdom, to fully embrace and encompass his achievements. 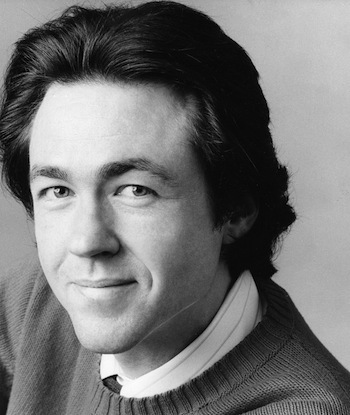 Specifically, in the P-CE’s “Ives Project,” it took three days of concerts, lectures, and a masterclass, plus guest appearances from pianist Jeremy Denk and baritone William Sharp. Due to work and other demands, I was not able to show as much commitment to the Ives Project as the P-CE did, but I caught both Thursday and Friday’s concerts at the Music Center at Strathmore. At most P-CE concerts, artistic director Joseph Horowitz strides on stage at some point to explain to the audience what they will hear or have just heard. 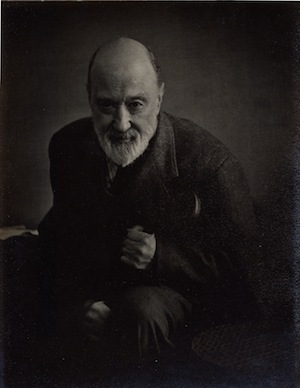 Thursday’s program, “Charles Ives: A Life in Music,” obviated such discourse by presenting contextual information from Ives’ own writings or other contemporary sources. Actors Carolyn Goelzer and the redoubtable Floyd King helped make the words come alive, so that Ives discussing his childhood enthusiasm for the circus naturally prepared us for his song “The Circus Band.” There were no gaps in the program where people got themselves ready to read or play; everything snapped into place, making a two-hour concert fly by. For most of the first half, Denk accompanied Sharp on piano. Two settings of Herman Almers’ “Feldeinsamkeit,” first that of Johannes Brahms and then that of the young Ives, came off especially well, with the second providing convincing evidence for the assertion King read us that the 24-year-old Ives’ effort merited consideration alongside that of the German master. Denk’s enthusiasm for both Brahms and Ives came across in his sensitive phrasing and limpid tone, and Sharp’s voice sounded its most honeyed and gorgeous. Sharp also had some help from the PostClassical Ensemble, conducted by the P-CE’s music director Angel Gil-Ordonez. Five songs whose accompaniment John Adams has transcribed for orchestra got intimate sounds from Sharp and the ensemble, especially when Sharp read the introduction to “Thoreau” as woodwinds and strings described a strange but rapt pastoral. The ensemble got some time alone to play a couple of Ives’ lesser-known short orchestral pieces, “In the Inn” and “Over the Pavements,” digging deep into Ives’ rough invention and, especially atop the pavements, his gleefully contrasting rhythms. The concert opened and closed with “The Unanswered Question,” with its querent harmonies in the strings, offstage woodwind murmurs and outbursts, and the implacable five-note solo trumpet utterance, here played with serene eloquence by Chris Gekker. Emerging from silence and a low-lit hall, it focused the attention immediately; as a closer, reflecting and reflected in all that had come before, I couldn’t stop thinking about it. Another canny trick of programming in an evening full of them. Friday’s program put Denk in the spotlight, playing Ives’ second piano sonata (subtitled “Concord, Mass., 1840-60”) and the “Hammerklavier,” the bangingest of the piano sonatas by Ives’ beloved Beethoven, back to back. This is a hell of a difficult program, but one Denk evidently finds rewarding, given that he toured with it a couple years ago (including a stop in the DMV) and still wanted to do it again. The P-CE dressed it up a bit. Sharp came back to read from Ives, Emerson, and Thoreau before each of the sonata’s four depictions of leading lights of Concord. These put one in a properly Transcendental mood before Denk’s performances. His program notes for the sonata (excerpted from his notes for his Ives CD, which is worth a purchase) outlined his thoughts on its major landmarks and threads, and his performance made you understand why he, artistic director Horowitz, and other iconoclastic souls love this sonata so much. Ives wrote the sonata on a broad canvas, and its forms are all generated from his ideas: the rhetoric of “Emerson,” building itself up from pronouncements and gestures; the wildness of “Hawthorne,” from spooky to out-of-control; the heaven-seeking purity of the main theme of “The Alcotts”; a hazy dawn and subsequent day at Walden Pond in “Thoreau.” The sonata’s quotations — the first few notes of Beethoven’s Fifth most prominent among them — make it sound like Ives is trying to gather into the sonata everything in the world, particularly in the Alcotts, which reminded me of spending hours messing around on a keyboard seeing what kinds of sounds can be made and occasionally finding something extraordinary. Denk expertly balanced narrative elements against each other; he coaxed myriad colors from his piano (which had to be retuned at intermission from the stress); most of all, he found fascinating moments each movement and showed us how one can connect them. Beethoven’s “Hammerklavier” should be a perfect analogue from the previous century: ambitious, lengthy, fearsomely difficult, and ultimately lowercase-T transcendent. Unfortunately, on Friday, Denk didn’t really have it under his fingers. It would be almost impossible not to drop or mis-hit a note or two during a performance of “Hammerklavier,” but Denk was doing it so much that the beginnings of favorite passages became occasions for anxiety: is he going to get through this? He also took the slow movement, marked “Adagio sostenuto” (“slow and sustained”), at a brisk walk that crossed the line from idiosyncrasy into incorrectness, particularly when Denk himself occasionally slowed down during variations only to return to the faster tempo. Still, I’ll remember that Concord Sonata for a long time, and it added to Thursday’s picture of Ives, here working in a longer form and accumulating power over that span. (I wish I could have attended Saturday’s concert, in which the JACK Quartet essayed Ives along with contemporary composers, to see the additional light such a juxtaposition would throw on Ives’ music.) The frustrating thing about Ives’ infrequent appearances in American concert halls is that it’s not difficult to understand what he’s up to; you just have to be open to hearing it. Denk, Sharp, and the P-CE made it easy to love Ives this weekend, and I hope some people in the audience felt it too. Jeremy Denk’s blog is always worth a read. Better than this one! Charles Ives was quite a fine writer too, which is part of why Thursday’s concert worked so well. If you’re getting into the Concord Sonata, Ives’ Essays Before a Sonata are worth reading. And they’re free, here. Updated to add Other People’s Perspectives: Cecilia Porter on Thursday’s concert, and Charles T. Downey on Saturday’s. I knew the latter was going to be good! 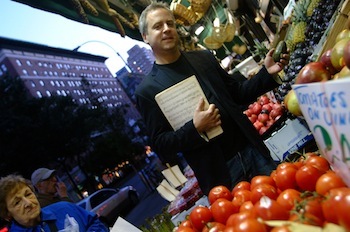 You are currently browsing the DMV Classical weblog archives for November 2011.